I have developed a habit over the years. Often times, when I get discouraged I turn to the writing of Martyn Lloyd-Jones. 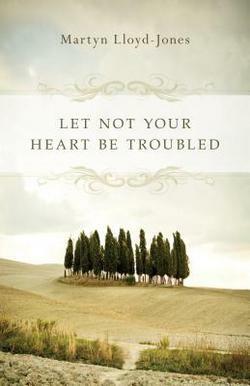 Let Not Your Heart Be Troubled is a collection of sermons penned and preached before the doctor went to be with the Lord in 1984. Each sermon is packed with Christ-centered wisdom and encouragement for weary pilgrims. In typical Lloyd-Jones fashion, the gospel stands at the center of each sermon and beckons readers to the cross of Christ. From 1952 to 1955, Martyn Lloyd-Jones offered a series of messages in the Westminster Chapel in London on doctrine. God the Holy Spirit is the second volume in a three-part study entitled, Great Doctrines of the Bible and is a result of those great meetings. The author has a passion to communicate in-depth doctrinal truth on a practical level. While doctrine is stressed, experiencing and living out that doctrine play a critical role in this book. The intent is to deepen the reader’s knowledge and love for God. Building upon the foundation of the messages entitled, “God the Father and God the Son,” Lloyd-Jones proceeds to explain the role of the Holy Spirit in the life of the believer. The author differentiates between general and effectual calling, discusses the significance of Pentecost, and covers the Holy Spirit’s responsibility in regeneration, conversion, repentance, justification by faith, and adoption. The author progressively builds upon previous doctrinal truth and stresses the importance of the order of salvation. He embraces the Reformed view (i.e. the biblical view) that regeneration precedes faith. The predominant views concerning sanctification are discussed as well as the baptism of the Spirit and the filling of the Spirit. The book concludes with a section that deals with the sealing of the Spirit and the gifts of the Holy Spirit. This work is filled with rich doctrinal truth from the pen of a truly great expository preacher and theologian. Lloyd-Jones teaches with precision. His words challenge the head and touch the heart. His writing is clear and loaded with logic. The main points are hammered again and again in the head of the reader. The author has a winsome way of promoting Reformed theology. Instead of getting trapped by the typical jargon associated with Reformed thought, Lloyd-Jones simply explains the doctrines from a Reformed viewpoint. Great Doctrines of the Bible is a welcome and necessary addition to any pastor’s library. Highly recommended!